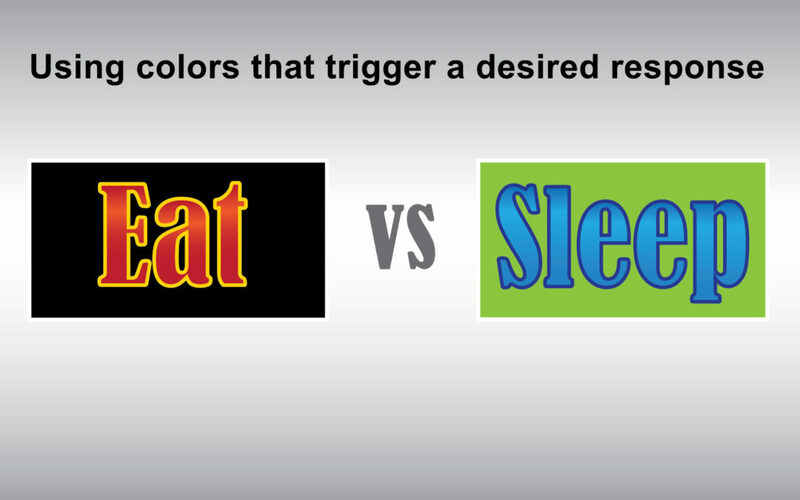 Color can influence a person’s choice when choosing a place to eat or sleep. After driving all day on the interstate, the sun is going down and you are looking for a place to eat and a place to sleep. As you pass all the fast food signage you notice that almost all the big chain corporate logos for fast food use red and yellow in combination as their way of enticing hungry travelers. Fast food is engineered to satisfy a hungry person’s desire to take care the most basic of human needs, to eat. Color in branding is part of that engineered customer experience. Red has been used to stimulate appetite since someone invented the red and white checkered table cloth. As illuminated, roadside signage red gets your attention faster than any other color, is easily read from a distance, and stimulates the idea that the food is hot, fresh, and ready to eat. Red invites you in. Yellow on the other hand is a color that appears in nature as a temporary flash of energy that quickly loses its brilliance and withers away like bright yellow wild flowers. Yellow is fast, and is used to keep the patrons moving, after you finish your food, you quickly realize that you need to get back on the road and find a place to stay for the night. Now you are looking for something very different, sleep. Colors used for hospitality branding are usually more calming, cooler, and convey a more tranquil feeling. Deep greens and blues project a calming, restful atmosphere that may be used in combination with a subordinate amount of red, orange or gold to catch your eye and present a feeling of warmth and comfort. Deeper, richer colors also project a feeling of trust, stability, and safety. Color is everywhere and is powerful in its ability to influence consumer decisions. Especially when used strategically to link the emotional value of color to the product it is selling. Are your company colors making your customers hungry or putting them to sleep?